Peace negotiators face a tough audience: while the parties to the conflict may want to lay down their arms and reintegrate into society, victims and the general public often strongly demand justice for human rights abuses. In the past, this “peace vs. justice” tradeoff often produced mutual amnesties. Today, however, international law under the Rome Statute requires accountability and criminal prosecutions for grave human rights abuses, and domestic public opinion in democratic contexts clamors for justice. There is also an increasingly robust menu of “transitional justice” options that post-conflict states can choose from to deal with legacies of the violent past. How can peace negotiators navigate these increasing pressures from above and below for some form of transitional justice, and still reach a peace accord to end civil conflicts? How might public opinion polls about attitudes towards various forms of transitional justice affect peace negotiations? The survey findings have the potential to help peace negotiators in several ways. First, they can tell human rights activists and peace negotiators the degree to which people will view different transitional justice arrangements as legitimate. This is crucial not only for predicting public approval in case of a referendum, as may happen in Colombia, but also for (re)generating the social cohesion required for sustainable peace. We found, for example, that even after acknowledging responsibility for lower-level crimes and disarming, the idea of demobilized combatants running for political office garners very little public support. Colombians call for "Peace without impunity," in rallies against peace talks between the Colombian government and the FARC. Second, the survey findings can help political leaders and negotiators frame messages to build coalitions of support for peace agreements. For example, our research showed that Colombians who voted against President Santos and his peace platform in the last election, or those who abstained from voting at all, could be persuaded to support not only the peace process in general, but even specific transitional justice proposals. This means that the negotiating parties can make progress with gestures such as their latest agreement to work together to remove land mines, or the FARC’s recent promise to no longer recruit children younger than 17. Third, our research showed that efforts to educate the public can boost the popular legitimacy of the peace process. Specifically, respondents who said they most understood the negotiations were also more likely to support the talks. In an interesting contrast to the findings by Kreps and Wallace, we found that invoking international law and comparative experiences does not necessarily lead to more positive attitudes about transitional justice proposals. In fact, subjects who were told that Colombia has an obligation to carry out transitional justice mechanisms in accordance with international law were slightly less supportive of such measures. 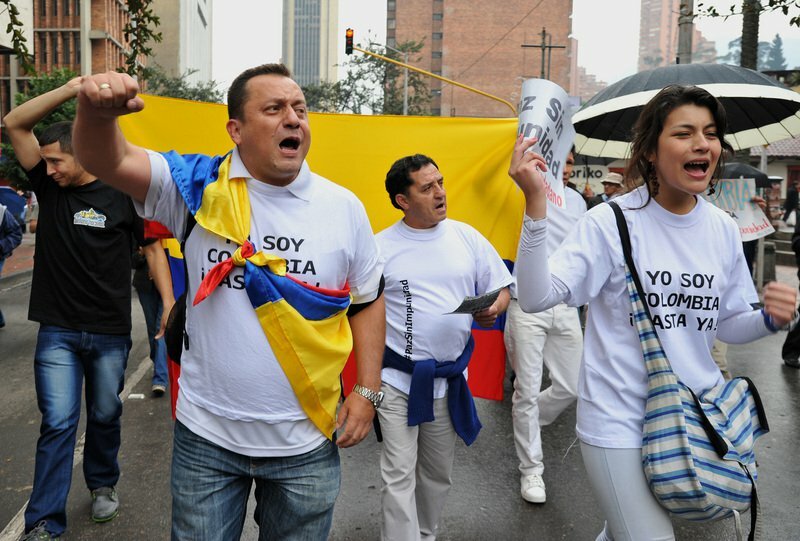 While Colombians may be ambivalent about international law and institutions—we speculate this is due to recent rulings against Colombia in the International Court of Justice and the Inter-American Court of Human Rights—we also found they are much more willing to accept transitional justice if told other countries in the region have done the same thing. What this indicates, in fact, is that international diffusion matters, but it is also deeply contextual. The way in which ordinary people understand international law and institutions often differs sharply from the interpretations of human rights activists and organizations. Yet gauging public opinion is complicated by the fact that many citizens rarely think about human rights. Thus, our work suggests there is value in providing context to the respondents. LAPOP results indicate a wide gulf in opinion, with most respondents answering that longer sentences contributed to reconciliation more than shorter ones. Consider the biennial Americas Barometer survey by the Latin American Public Opinion Project (LAPOP). In 2014, it asked what would contribute more to reconciliation: if FARC human rights violators received sentences of five to eight years in jail, or if they received over eight years. The question was pertinent because many former paramilitary leaders of the Autodefensas Unidas de Colombia (AUC), another key party to the conflict, have spent or will spend five to eight years in jail, and survey respondents were aware of this. LAPOP results indicate a wide gulf in opinion, with most respondents answering that longer sentences contributed to reconciliation more than shorter ones. The results from these questions—asked without context—contrast greatly with our experimental results. Specifically, in our survey we described exactly what human rights abuses a FARC commander we named Francisco committed (kidnapped a group of people for several years), his own motivations (to help the struggle), and the forms of transitional justice he underwent (publicly recognized crimes, disarmed, and paid reparations). Subjects were then randomly assigned to one of three punitive justice outcomes: (1) no jail time, even though some paramilitary/AUC commanders did go to jail for the same crime; (2) several years, about the same as paramilitary/AUC commanders; or (3) many years in jail, many more than paramilitary/AUC commanders. Afterwards, subjects were asked to rate the sentencing outcome on the grounds of fairness, contribution to reconciliation and contribution to peace. Answers were summed into an index where 1 represented the lowest and 7 the highest rated outcome, in terms of perceived legitimacy. Comparing mean levels across groups, jail time for FARC and paramilitary commanders was ranked as the most appropriate (legitimate) outcome. The gap between equal jail time and more jail time was small but significant, and the “no jail” option was ranked as far less legitimate than any amount of jail time. These answers are markedly different from the Americas Barometer survey noted above, and as a result we conclude that providing context around crimes and perpetrators can improve support for transitional justice measures. This is a message that should resonate with any practitioners seeking to alter public opinion on these difficult issues. The advent of nationally representative online surveys and the proliferation of survey experimental approaches have expanded the horizons of public opinion research for human rights scholars and practitioners. Data from single surveys can generate initial insights into public opinion, and more rigorous statistical analysis provides a degree of control for testing those insights. Of course, determining causality is still complex, and definitive conclusions are not always possible. Threats to the validity of survey outcomes are often present. When used correctly, however, survey experiments can diminish these threats. Not only does this make our scholarship more rigorous, it should make our policy prescriptions more effective. This research was funded by the US Agency for International Development (USAID), through a subaward managed by the Institute of International Education (IIE) under Cooperative Agreement #AID-OAA-A-12-00039. The contents are the sole responsibility of the authors.